Rubellimicrobium thermophilum Denner et al. 2006 is the type species of the genus Rubellimicrobium, a representative of the Roseobacter clade within the Rhodobacteraceae. Members of this clade were shown to be abundant especially in coastal and polar waters, but were also found in microbial mats and sediments. They are metabolically versatile and form a physiologically heterogeneous group within the Alphaproteobacteria. Strain C-Ivk-R2A-2T was isolated from colored deposits in a pulp dryer; however, its natural habitat is so far unknown. Here we describe the features of this organism, together with the draft genome sequence and annotation and novel aspects of its phenotype. The 3,161,245 bp long genome contains 3,243 protein-coding and 45 RNA genes. Strain C-Ivk-R2A-2T (= DSM 16684 = CCUG 51817 = HAMBI 2421) is the type strain of the species Rubellimicrobium thermophilum . The genus name Rubellimicrobium was derived from the Neo-Latin adjective ‘rubellus’, red or reddish, and the Neo-Latin noun ‘microbium’, microbe, referring to its reddish pigmentation. The species epithet was derived from the Greek noun ‘thermê’, heat, as well as from the Neo-Latin adjective ‘philus –a –um’, friend/loving, referring to its growth temperature . C-Ivk-R2A-2T was isolated from colored deposits in a pulp dryer in Finland, so the natural habitat is so far unknown . At the time of writing, PubMed records did not indicate any follow-up research with strain C-Ivk-R2A-2T after the initial description and valid publication of the new name Rubellimicrobium thermophilum . Here we present a summary classification and a set of features for R. thermophilum C-Ivk-R2A-2T, together with the description of the genomic sequencing and annotation. We also describe novel aspects of its phenotype. The single genomic 16S rRNA gene sequence of R. thermophilum DSM 16684T was compared using NCBI BLAST [2,3] under default settings (e.g., considering only the high-scoring segment pairs (HSPs) from the best 250 hits) with the most recent release of the Greengenes database  and the relative frequencies of taxa and keywords (reduced to their stem ) were determined, weighted by BLAST scores. The most frequently occurring genera were Rubellimicrobium (26.9%), Oceanicola (18.5%), Rhodobacter (12.4%), Methylarcula (10.4%) and Loktanella (10.1%) (37 hits in total). Regarding the five hits to sequences from members of the species, the average identity within HSPs was 99.9%, whereas the average coverage by HSPs was 99.2%. Among all other species, the one yielding the highest score was 'Pararubellimicrobium aerilata' (EU338486), which corresponded to an identity of 94.2% and an HSP coverage of 97.8%. (Note that the Greengenes database uses the INSDC (= EMBL/NCBI/DDBJ) annotation, which is not an authoritative source for nomenclature or classification.) The highest-scoring environmental sequence was AJ489269 (Greengenes short name ‘food Echinamoeba thermarum clone’), which showed an identity of 99.9% and an HSP coverage of 99.1%. The most frequently occurring keywords within the labels of all environmental samples which yielded hits were 'skin' (10.1%), 'fossa' (6.0%), 'poplit' (3.6%), 'forearm, volar' (3.6%) and 'water' (2.5%) (213 hits in total). The most frequently occurring keywords within the labels of those environmental samples which yielded hits of a higher score than the highest scoring species were 'biofilm' (18.2%), 'echinamoeba, food, thermarum' (9.1%) and 'color, machin, moder, paper, paper-machin, thermophil' (9.1%) (2 hits in total). Figure 1 shows the phylogenetic neighborhood of R. thermophilum in a 16S rRNA sequence based tree. The sequence of the single 16S rRNA gene copy in the genome does not differ from the previously published 16S rDNA sequence (AJ844281). Phylogenetic tree highlighting the position of R. thermophilum relative to the type strains of the type species of the other genera within the family Rhodobacteraceae. The tree was inferred from 1,330 aligned characters [6,7] of the 16S rRNA gene sequence under the maximum likelihood (ML) criterion . Rooting was done initially using the midpoint method  and then checked for its agreement with the current classification (Table 1). The branches are scaled in terms of the expected number of substitutions per site. Numbers adjacent to the branches are support values from 650 ML bootstrap replicates  (left) and from 1,000 maximum-parsimony bootstrap replicates  (right) if larger than 60%. Lineages with type strain genome sequencing projects registered in GOLD  are labeled with one asterisk, those also listed as 'Complete and Published' with two asterisks . Classification and general features of R. thermophilum C-Ivk-R2A-2T according to the MIGS recommendations . Cells of strain C-Ivk-R2A-2T stain Gram-negative are rod shaped and 0.6-0.8 µm in width and 2.0-4.0 µm in length (Figure 2) . Cells are motile and possess one to three polar flagella . C-Ivk-R2A-2T is moderately thermophilic and grows over a temperature range of 28–56°C with an optimum between 45°C and 52°C, whereas no growth occurs at room temperature or at temperatures higher than 57°C. Colonies grown on Reasoner’s 2A agar (R2A) at 45°C for 2 days are translucent, entire, convex and smooth. Cells are red-pigmented (carotenoids); the pigment absorbance spectrum reveals three distinct peaks: one major peak at 495 nm and to others at 465 nm and 525 nm . Cells are strictly aerobic. Growth does not occur under anaerobic conditions whether or not the cultures are grown in the dark or the light. Bacteriochlorophyll a is not synthesized. Cells are cytochrome c-oxidase positive, weakly positive for catalase as well as urease-positive. Nitrate is not reduced . Intracellular inclusion bodies containing polyphosphate and polyhydroxyalkanoates are produced . Micrograph of R. thermophilum DSM 16684T. The cells of strain C-Ivk-R2A-2T assimilate the following compounds: L-arabinose, p-arbutin, D-cellobiose, D-fructose, D-galactose, gluconate, D-glucose, D-mannose, D-maltose, α-D-melibiose, D-rhamnose, D-ribose, sucrose, salicin, D-trehalose, D-xylose, adonitol, myo-inositol, maltitol, D-mannitol, D-sorbitol, acetate, 4-aminobutyrate, glutarate, DL-3-hydroxybutyrate, DL-lactate, L-malate, oxoglutarate, pyruvate, L-alanine, L-ornithine and L-proline. Cells do not produce acid from D-glucose, lactose, sucrose, L-arabinose, L-rhamnose, maltose, D-xylose, cellobiose, D-mannitol, dulcitol, salicin, adonitol, myo-inositol, sorbitol, raffinose, trehalose, methyl α-D-glucoside, erythritol, melibiose, D-arabitol or D-mannose . The strain does not assimilate the following compounds: N-acetyl-D-glucosamine, putrescine, propionate, cis- and trans-aconitate, adipate, azelate, citrate, fumarate, itaconate, mesaconate, suberate, β-alanine, L-aspartate, L-histidine, L-leucine, L-phenylalanine, L-serine, L-tryptophan, 3- and 4-hydroxybenzoate and phenylacetate . The following compounds are hydrolyzed by strain C-Ivk-R2A-2T: p-nitrophenyl (pNP) α-d-glucopyranoside, pNP β-D-glucopyranoside, bis-pNP phosphate, pNP phenylphosphonate and L-alanine p-nitroanilide (pNA), whereas aesculin, pNP β-D-galactopyranoside, pNP β-D-glucuronide, pNP phosphorylcholine, 2-deoxythymidine-5′-pNP phosphate, L-glutamate-γ-3-carboxy pNA, L-proline pNA, Tween 80, starch and casein are not hydrolyzed . Strain C-Ivk-R2A-2T was also found to be susceptible to ampicillin, chloramphenicol, colistin sulfate, gentamicin, kanamycin, lincomycin, neomycin, nitrofurantoin, penicillin G, polymyxin B, streptomycin, tetracycline and vancomycin . The physiology of R. thermophilum DSM 16684T was investigated in this study using Generation-III microplates in an OmniLog phenotyping device (BIOLOG Inc., Hayward, CA, USA). The microplates were inoculated at 28°C and 37°C, respectively, with a cell suspension at a cell density of 95-96% turbidity and dye IF-A. Further additives were vitamin, micronutrient and sea-salt solutions. The plates were sealed with parafilm to avoid a loss of fluid. The exported measurement data were further analyzed with the opm package for R [23,24], using its functionality for statistically estimating parameters from the respiration curves such as the maximum height, and automatically translating these values into negative and positive reactions. At 28°C, the strain was positive for D-turanose, pH 6, 1% NaCl, 4% NaCl, D-galactose, 3-O-methyl-D-glucose, D-fucose, L-fucose, L-rhamnose, 1% sodium lactate, myo-inositol, rifamycin SV, L-aspartic acid, L-glutamic acid, L-histidine, L-serine, D-glucuronic acid, quinic acid, L-lactic acid, citric acid, α-keto-glutaric acid, D-malic acid, L-malic acid, nalidixic acid, potassium tellurite, acetoacetic acid and sodium formate. The strain was negative for dextrin, D-maltose, D-trehalose, D-cellobiose, β-gentiobiose, sucrose, stachyose, pH 5, D-raffinose, α-D-lactose, D-melibiose, β-methyl-D-galactoside, D-salicin, N-acetyl-D-glucosamine, N-acetyl-β-D-mannosamine, N-acetyl-D-galactosamine, N-acetyl-neuraminic acid, 8% NaCl, D-glucose, D-mannose, D-fructose, inosine, fusidic acid, D-serine, D-sorbitol, D-mannitol, D-arabitol, glycerol, D-glucose-6-phosphate, D-fructose-6-phosphate, D-aspartic acid, D-serine, troleandomycin, minocycline, gelatin, glycyl-L-proline, L-alanine, L-arginine, L-pyroglutamic acid, lincomycin, guanidine hydrochloride, niaproof, pectin, D-galacturonic acid, L-galactonic acid-γ-lactone, D-gluconic acid, glucuronamide, mucic acid, D-saccharic acid, vancomycin, tetrazolium violet, tetrazolium blue, p-hydroxy-phenylacetic acid, methyl pyruvate, D-lactic acid methyl ester, bromo-succinic acid, lithium chloride, tween 40, γ-amino-n-butyric acid, α-hydroxy-butyric acid, β-hydroxy-butyric acid, α-keto-butyric acid, propionic acid, acetic acid, aztreonam, butyric acid and sodium bromate. At 37°C, the strain was positive for D-maltose, D-trehalose, D-cellobiose, β-gentiobiose, sucrose, D-turanose, stachyose, pH 6, D-raffinose, D-melibiose, β-methyl-D-galactoside, D-salicin, 1% NaCl, 4% NaCl, D-glucose, D-mannose, D-fructose, D-galactose, 3-O-methyl-D-glucose, D-fucose, L-fucose, L-rhamnose, inosine, 1% sodium lactate, D-sorbitol, D-mannitol, D-arabitol, myo-inositol, glycerol, rifamycin SV, L-alanine, L-arginine, L-aspartic acid, L-glutamic acid, L-histidine, L-serine, pectin, D-gluconic acid, D-glucuronic acid, glucuronamide, quinic acid, methyl pyruvate, L-lactic acid, citric acid, α-keto-glutaric acid, D-malic acid, L-malic acid, nalidixic acid, potassium tellurite, tween 40, γ-amino-n-butyric acid, β-hydroxy-butyric acid, propionic acid, acetic acid and sodium formate. No reactions could be observed for dextrin, pH 5, α-D-lactose, N-acetyl-D-glucosamine, N-acetyl-β-D-mannosamine, N-acetyl-D-galactosamine, N-acetyl-neuraminic acid, 8% NaCl, fusidic acid, D-serine, D-glucose-6-phosphate, D-fructose-6-phosphate, D-aspartic acid, D-serine, troleandomycin, minocycline, gelatin, glycyl-L-proline, L-pyroglutamic acid, lincomycin, guanidine hydrochloride, niaproof, D-galacturonic acid, L-galactonic acid-γ-lactone, mucic acid, D-saccharic acid, vancomycin, tetrazolium violet, tetrazolium blue, p-hydroxy-phenylacetic acid, D-lactic acid methyl ester, bromo-succinic acid, lithium chloride, α-hydroxy-butyric acid, α-keto-butyric acid, acetoacetic acid, aztreonam, butyric acid and sodium bromate. According to , R. thermophilum is able to metabolize a wide range of carbon sources. This observation is not fully confirmed by the OmniLog measurements at 28°C. For instance, more than eleven sugars were not metabolized under the given cultivation conditions in the Generation-III microplates. This is apparently caused by distinct cultivation conditions, because the behavior is in high agreement with  if a temperature of 37°C is chosen, which is closer to the reported optimum temperature . Particularly the optimal growth temperature of 45°C highly differs from the one that had to be used in the OmniLog assays (28°C). Conversely, in contrast to  the OmniLog measurements yielded positive reactions for citrate, L-histidine and L-serine at 28°C and additionally for propionate at 37°C. This may be due to the higher sensitivity of respiratory measurements compared to growth measurements [24,25]. The principal cellular fatty acids of strain C-Ivk-R2A-2T are C19:0 cyclo ω7c (43.9 %), C16:0 (22.3 %), C18:0 (22.0 %), C18:1 ω7c (4.5 %), C10:0 3-OH (1.2 %), C18:1 ω7c 11-methyl (0.9 %), C20:2 ω6,9c (0.7 %), C17:0 cyclo (0.5 %)C17:0 (0.4 %) and summed feature 2 containing C16:1 iso I and/or C14:0 3-OH (1.2 %). Two unknown fatty acids are identified by their equivalent chain length (ECL): ECL 11.799 (2.3 %) as well as ECL 17.322 (0.7 %) . Additionally, ubiquinone Q-10 is the predominant respiratory lipoquinone, but ubiquinone Q-9 was also detected in minor amounts . The polyamine pattern is characterized by the major compounds spermidine (11.5 µmol/g dry weight), sym-homospermidine (9.7 µmol/g dry weight) and putrescine (8.9 µmol/g dry weight) . Minor polyamine pattern compounds are spermine (1.9 µmol/g dry weight), sym-norspermidine (0.4 µmol/g dry weight), cadaverine (0.1 µmol/g dry weight) and diaminopropane in trace amounts . Interestingly, this polyamine composition is different from other previously reported members of the family Rhodobacteraceae. Whereas members of Paracoccus, Rhodobacter, Rhodovulum and Roseomonas mainly contain spermidine and putrescine, the polyamine compound sym-homospermidine is not detectable in these representatives . The genome was sequenced within the project “Ecology, Physiology and Molecular Biology of the Roseobacter clade: Towards a Systems Biology Understanding of a Globally Important Clade of Marine Bacteria” funded by the German Research Council (DFG). The strain was chosen for genome sequencing according the Genomic Encyclopedia of Bacteria and Archaea (GEBA) criteria [26,27]. Project information is stored at the Genomes On-Line Database . The Whole Genome Shotgun (WGS) sequence is deposited in Genbank and the Integrated Microbial Genomes database (IMG) . A summary of the project information is shown in Table 2. 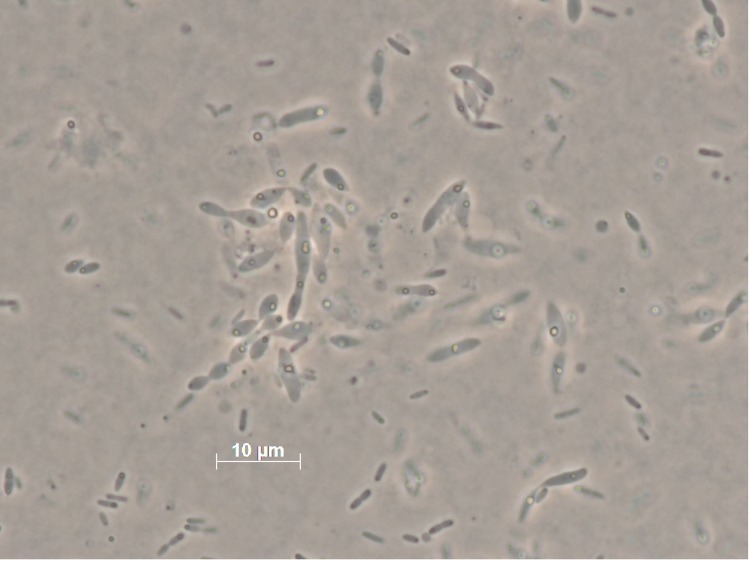 A culture of DSM 16684T was grown aerobically in DSMZ medium 830 (R2A medium)  at 45°C. Genomic DNA was isolated using Jetflex Genomic DNA Purification Kit (GENOMED 600100) following the standard protocol provided by the manufacturer but modified by an incubation time of 60 min, the incubation on ice over night on a shaker, the use of additional 50 µl proteinase K, and the addition of 100 µl protein precipitation buffer. DNA is available from DSMZ through the DNA Bank Network . The genome was sequenced using a combination of Illumina and 454 libraries (Table 2). Illumina sequencing was performed on a GA IIx platform with 150 cycles. The paired-end library contained inserts of 456 nt length in average. To correct sequencing errors and improve quality of the reads, clipping was performed using fastq-mcf  and quake . The remaining 4,190,250 reads with an average length of 106 nt were assembled using Velvet . To gain information on the contig arrangement an additional 454 run was performed. The paired-end jumping library of 3 kb insert size was sequenced on a 1/8 lane. Pyrosequencing resulted in 115,925 reads, with an average read length of 451 nt, assembled with Newbler (Roche Diagnostics) into a draft assembly comprising 36 scaffolds. Both draft assemblies (Illumina and 454 sequences) were fractionated into artificial Sanger reads of 1000 nt in length plus 75 nt overlap on each site. These artificial reads served as an input for the phred/phrap/consed package . By manual editing the number of contigs was reduced to 43 organized in ten scaffolds. The combined sequences provided a 203 × coverage of the genome. Genes were identified using Prodigal  as part of the JGI genome annotation pipeline . The predicted CDSs were translated and used to search the National Center for Biotechnology Information (NCBI) non-redundant database, UniProt, TIGR-Fam, Pfam, PRIAM, KEGG, COG, and InterPro databases. Identification of RNA genes were carried out by using HMMER 3.0rc1  (rRNAs) and tRNAscan-SE 1.23  (tRNAs). Other non-coding genes were predicted using INFERNAL 1.0.2  Additional gene prediction analysis and functional annotation was performed within the Integrated Microbial Genomes - Expert Review (IMG-ER) platform . CRISPR elements were detected using CRT  and PILER-CR . The genome statistics are provided in Table 3 and Figure 3. The genome has a total length of 3,161,245 bp and a G+C content of 69.1%. Of the 3,288 genes predicted, 3,243 were protein-coding genes, and 45 RNAs. The majority of the protein-coding genes (80.4%) were assigned a putative function while the remaining ones were annotated as hypothetical proteins. The distribution of genes into COGs functional categories is presented in Table 4. Map of the largest scaffold. From bottom to top: Genes on forward strand (color by COG categories), Genes on reverse strand (color by COG categories), RNA genes (tRNAs green, rRNAs red, other RNAs black), GC content, GC skew (purple/olive). The ten scaffolds of the draft genome sequence of strain C-Ivk-R2A-2T were screened with BLAST for the presence of the four abundant plasmid replicases from the Rhodobacterales, representing DnaA-like, RepABC-, RepA- and RepB-type replicons . None of these typical extrachromosomal elements was detected. Prophage-like structures have been found in many bacteria and they are known to drive the diversity of bacteria by facilitating lateral gene transfer . 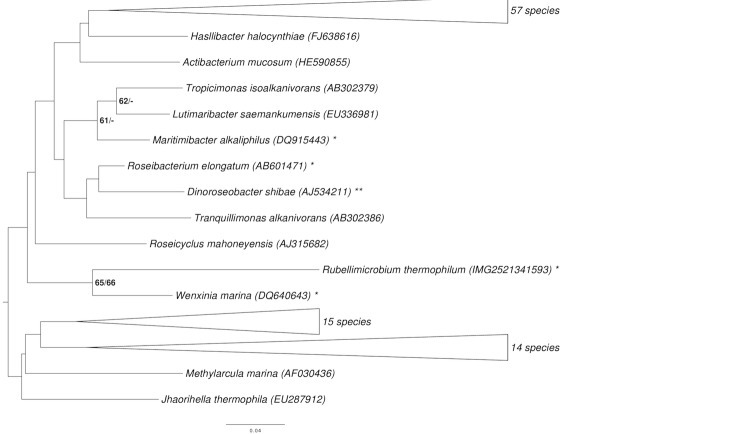 Genome analysis of strain DSM 16684T revealed the presence of several genes encoding proteins associated with prophages (ruthe_00218 to 00220, ruthe_00605, ruthe_00607 to 00610, ruthe_00612, ruthe_00614, ruthe_00617, ruthe_00618, ruthe_00620, ruthe_2061, ruthe_2066, ruthe_02072, ruthe_02185, ruthe_02480, ruthe_02482 to 02484, ruthe_02495, ruthe_02499, ruthe_02502, ruthe_02972, ruthe_02974, ruthe_02976, ruthe_02977, ruthe_02984, ruthe_02988, and ruthe_02991 to 03295). The soxB gene (ruthe_01788) encodes a component of the thiosulfate-oxidizing Sox enzyme complex, which is known to be part of the genomes of various groups of bacteria . Several other genes involved in this process were also detected (e.g. ruthe_01784, ruthe_01785 and ruthe_01786). Genome analysis of strain R. thermophilum DSM 16684T further revealed the presence of several genes encoding proteins associated with the utilization of urease (ruthe_02149 to 02151, ruthe_02153 to 02156). Several genes encoding proteins involved in the transport of Fe3+-siderophores and Fe3+-hydroxamate via ABC-transporters were also detected (e.g. ruthe_03167 to 03172). Additionally, several gene sequences associated with CRISPRs (ruthe_02227 to 02230, ruthe_02232 to 02234, ruthe_02250, ruthe_02251, ruthe_02253 and ruthe_02255), cytochrome c oxidase activity (ruthe_00413 to 00417), cytochrome cbb3 oxidase activity (ruthe_01647 to 01654) as well as cytochrome bd-I ubiquinol oxidase activity (ruthe_01776, ruthe_01777) were found. Additional gene sequences of interest encode a predicted ring-cleavage extradiol dioxygenase (ruthe_00477), which indicates a possible degradation of aromatic compounds. A sensor of blue light using FAD (BLUF, ruthe_01818) was also found, indicating possible blue-light dependent signal transduction. The authors gratefully acknowledge the assistance of Iljana Schröder for growing R. thermophilum DSM 16684T cultures and Meike Döppner for DNA extraction and quality control (both at the DSMZ). This work was performed under the auspices of the German Research Foundation (DFG) Transregio-SFB 51 Roseobacter grant.